Robert Lewandowski scored twice as Bayern Munich emphatically wrapped up a fifth straight league crown. Bayern celebrate their title win. 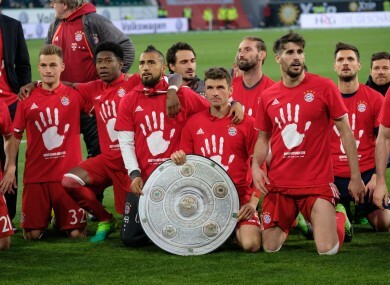 BAYERN MUNICH CLINCHED a record-extending fifth consecutive title thanks to a 6-0 battering of Wolfsburg last night. RB Leipzig’s goalless draw with Ingolstadt earlier on Saturday meant Bayern headed into the contest at the Volkswagen Arena knowing three points would be enough to retain their domestic crown with three games to spare. And the Bavarians produced an emphatic performance as David Alaba’s strike, Robert Lewandowski’s brace and goals from Arjen Robben, Thomas Muller and Joshua Kimmich earned Carlo Ancelotti a league winners’ medal in his first season since replacing Pep Guardiola as head coach. Wolfsburg – who had Luiz Gustavo sent off late on – had conceded 12 goals in their past three league meetings with Bayern and the champagne was on ice when Alaba opened the scoring with a stunning 19th-minute free-kick. Lewandowski extended his brilliant record against Wolfsburg as his first-half double made it 10 goals in his past four matches against them. Robben’s low effort and Muller’s predatory finish added to the rout after the break, before Joshua Kimmich ensured Bayern bettered the 5-0 win from December’s reverse fixture. For Bayern, the title win will go some way to making up for a hugely disappointing April that has seen them exit the Champions League at the quarter-final stage while they crashed out of the DFB-Pokal at the hands of Borussia Dortmund in midweek. The Dortmund setback led to rumours that Ancelotti’s long-term future at the Allianz Arena may be in doubt, but the Italian refuted those reports and he can now start planning for another assault on domestic and European glory next season. Bayern dominated the ball in the early stages, but were fortunate former striker Mario Gomez was unable to capitalise on rounding Sven Ulreich in the eighth minute. It was a moment of genius that put the visitors ahead, though. Muller was felled by Daniel Didavi 25 yards from goal and Alaba curled a sumptuous free-kick into the top right-hand corner. Buoyed by the goal, Bayern pushed on and Koen Casteels made a strong one-handed save from Lewandowski’s edge-of-the box drive before the goalkeeper showed immense reflexes to also keep out Muller’s follow up. Casteels was helpless to prevent Bayern’s second, though. Kingsley Coman led the break to play in Muller on the left of the area and he squared for Lewandowski, who took a touch to get it out of his feet and hammered his shot emphatically past Casteels. It was game over before the break when Coman – who this week agreed to join Bayern on a permanent deal from Juventus for next season – turned away from Didavi and cut back for Lewandowski to drill home a third. There was little change to the script after half-time and Alaba crashed an effort against the left-hand post shortly after the restart. A fourth goal arrived in the 67th minute with a trademark goal from Robben, who cut in from the right and hit a 25-yard daisycutter into the bottom-right corner. Wolfsburg’s misery worsened when ex-Bayern man Gustavo man was shown a second yellow card for kicking the ball away, and the visitors continued to run riot with Muller shooting into an unguarded goal after Lewandowski’s effort had hit the post. Bayern were not quite done, though, and Wolfsburg were hit for six when Robben’s cross from the left was collected at the far post by Kimmich and he drilled past Casteels. Email “Untouchable! Ancelotti's Bayern clinch record-extending Bundesliga title in style ”. Feedback on “Untouchable! Ancelotti's Bayern clinch record-extending Bundesliga title in style ”.